COMMENT – Writers don’t do teachers and schools very well on television, do they? Whether it’s sitcom, soap or drama, any pretence at realism is seen off at the door by realism’s arch enemy: lack of research. Hence, in EastEnders we regularly hear pupils at the local comprehensive in Walford telling people that the reason they are out of school is a ‘free lesson’, even though eny fule kno it’s only sixth formers who get them. In Coronation Street we have Brian, a man who was only a couple of years ago a rather mediocre English teacher, but was miraculously transformed into a primary school head teacher in spite of the fact that such a thing would never happen. You could almost hear the story line conference and the phrase ‘How hard can it be?’ used to justify Brian’s promotion to a post for which he had no qualifications or experience other than his PGCE. If I have to apportion blame for television’s continued inability to offer a portrayal of contemporary state schools, I think I’d have to go for John Esmonde and Bob Larbey. They wrote ‘Please Sir’ back in the late sixties, thereby establishing the script writers’ convention that state schools in TV drama or sitcoms must in no sense be remotely recognisable to staff or pupils. Esmonde and Larbey created Bernard Hedges, the young teacher fresh out of training who is thrown to the lions when he’s allocated to teach 5C, the worst, most challenging class in the school (I was only 10 when ‘Please Sir’ first appeared, but even I knew that at secondary school you didn’t have the same teacher for all your subjects), but who quickly wins over their hostility and establishes himself as their friend and defender. That the boys and girls of 5C were about as challenging as a small group of sedated choirboys appeared to pass by most of the fans of ‘Please Sir’. I will also ask for Grange Hill to be taken into consideration for its supplementary role in embedding the convention. You remember Grange Hill – the only school in Britain where pupils spoke in turn and never interrupted each other or their teachers, no matter how fierce the argument. And as for Waterloo Road, with its procession of heads who have behaved as if being sacked for gross misconduct were their only ambition in life, the less said the better, given that it was closed within a matter of days when it usually takes at least two years to close a school. 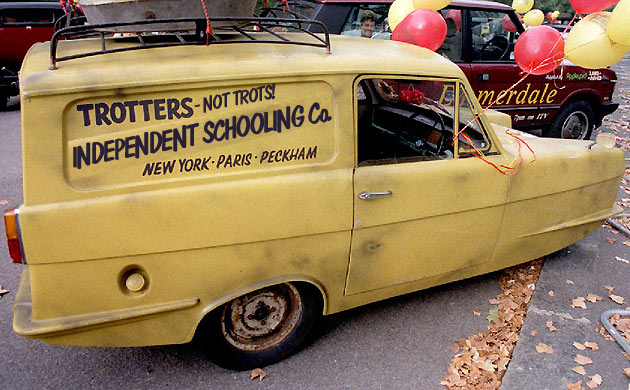 I did actually laugh out loud when I heard that in the next series it will re-open as a free school inScotland, despite the fact that such schools are not actually allowed north of the border. Apparently, many of the same pupils fromWaterloo Road’s former incarnation are going to attend the new Scottish model, so presumably the school is going to offer boarding as well. I can see some readers are not convinced by this one example, so let’s turn to my next exhibit. It emerged last week, when the list of the latest groups to be approved to open free schools was released, that Michael ‘smash the state education system within the government’s term of office’ Gove has approved a group who plan to teach creationism. The backers – who had their bid rejected last year because they wanted to teach creationism as part of the science curriculum – say that Exemplar Academy in Newark will have what they call a ‘faith ethos’ but will not be formally designated a faith school. Gove has given approval to the new bid because they ‘will only teach creationism in RE’. Goodness me, I’m much relieved and my fears have been utterly and completely allayed by this apparent compromise. I shall, furthermore, accept happily the subsequent opening of schools run by Scientologists, flat-earthers and people who want to teach children that there are fairies at the bottom of the garden in a subject called ‘horticulture studies’. If you are still not persuaded that education has turned into a sitcom entitled ‘Only Goves and Wilshaws’ – in which a pair of spivvy government-appointed education wonks drive around the country in a comedy three-wheeler car (the one the clowns drive at the circus is what I have in mind, wherein the doors fall off at regular intervals), devising some new wheeze for selling off the nation’s schools in each episode – then the next example must surely change your mind. I have to admit to being thrilled to find out earlier this week that Michael ‘Having smashed the state education system, let my pals make oodles of cash out of it’ Gove had commissioned Henry Dimbleby, founder of the Leon chain of restaurants, to conduct yet another investigation into school meals…after they’d been on holiday together in Morocco. I didn’t need Jamie Oliver’s righteous indignation at the new ‘investigation’ and its cost, or to consider how long it was going to take for this ‘investigation’ to tell us what we already knew from when Labour did it some years earlier. I didn’t even need to think about how the Tories have smashed apart the compulsion for all state schools to provide nutritionally balanced meals, by allowing free schools and academies to peddle to children any kinds of junk they wish. All I needed was to remember what David Cameron said in a speech in February 2010: “In this party, we believe in competition, not cronyism.” It’s a shame for Mr Cameron that his most ambitious secretary of state doesn’t share his beliefs, but I think it’s more of a shame that Gove has no shame. I think it’s time to bring back ‘Please Sir’, re-worked for the 21st century and refreshed with stories drawn from more recent educational initiatives. Fenn St school would be renamed ‘Bishop Ussher Free School’, in which all subjects are taught according to literalist Biblical interpretation. And before you laugh too much at my fictional example, you might want to check out the website of the independent ‘Bethany School’ in Sheffield, which states “We do not follow the National Curriculum atBethanySchool because we are committed to developing our own distinctively Christian curriculum, based upon biblical principles.” Having done so, please join me in thanking whoever it was at the DfE who was sane enough to turn down this organisation’s application to open a Free school. Ms Freeborn is spot on in every article of hers that I have read. Apart from telling it exactly how it is with a succinct clarity that dazzles , she always manages to make me laugh. And one certainly has to laugh at what is happening in the black comedy of education at present, under the aegis of the farcical Gove, or one would weep at the horrific mismanagement of it.